History: (What If? II#13 (fb)) - While serving duty in Korea, Charles Xavier followed his stepbrother, Cain Marko into a cave. Inside the cave, Cain found the Ruby of Cyttorak and attempted to grab it, but was stopped by the interference of Xavier, who warned Cain not to touch it. While attempting to push Cain aside, Xavier came into contact with the ruby and began to transform. As Xavier's transformation continued, a barrage of shelling caused the cave to collapse in and Cain left his stepbrother in the cave-in, spouting threats that Xavier would pay for costing him the ruby. (What If? II#13 (fb)) - Years later, Xavier began to make his way back to the surface, while the mutant known as Magneto made mutants public by attacking Cape Citadel. Although Magneto was driven away by the Fantastic Four, the public saw all mutants as evil like Magneto. Magneto eventually formed the Brotherhood of Evil Mutants, as Xavier continued his trek back to the surface. After the formation of the Brotherhood, Magneto took over the small country of Santo Marco and eventually formed the Brotherhood into a mutant army. (What If? II#13 (fb)) - Months later, Magneto led the Brotherhood's attack on the United Nations, with the intent to kidnap the representatives of the various nations and ransom them. During the attack, the Brotherhood member known as Iceman was killed by a soldier wielding a flamethrower, and the Beast was shot in the arm. As the Brotherhood began to lose the battle against the U. S. military, Charles Xavier revealed himself, having dug his way of the cave in Korea, and appeared before the United Nations to announce that all mutants were now under his protection and that any human attacking a mutant would have to answer to him. Xavier then left the U. N. building and told the mutants outside that he would lead them to a safe place. Angered, Magneto challenged Xavier's claim on his mutant army. Unaffected by Magneto's magnetic assault, Xavier grabbed Magneto's helmet and crushed it in his hand. After Magneto left, Xavier re-christened the Brotherhood as the X-Men and returned to the Xavier Estate in Westchester, New York. (What If? II#13 (fb)) - Upon his return, Xavier kicked Cain Marko out of the Xavier Estate, which he had inherited. Vowing once again that he would make Charles Xavier pay, Cain met up with Magneto, who devised a handband that prevented Xavier from telepathically accessing Cain's mind. Magneto intended to use Cain as his eyes on Earth, while he planned his revenge on Xavier from his asteroid base. (What If? II#13 (fb)) - Soon after the Juggernaut arrived at the Xavier Estate, it was attacked by Sentinel robots. Charles Xavier, now calling himself the Juggernaut, easily destroyed the Sentinels and tracked their command signals to the Sentinel manufacturing base, where he destroyed the Master Mold. Upon hearing of the Juggernaut's rampage, the Fantastic Four attacked the X-Men. During the battle, Xavier left his X-Men to battle the FF while he escaped to his laboratory and linked his mind with Reed Richards, Doctor Doom, Michael Morbius, and Bruce Banner. 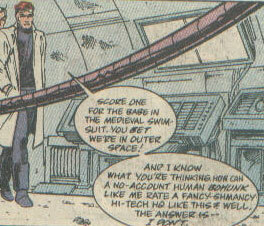 Using their knowledge, Xavier created a device that fired a gas capable of removing the powers of superhumans. He then returned to the battle and sprayed the Fantastic Four with the gas, causing them to lose their powers. Xavier then ordered the foursome to leave, warning them not to bother them again. (What If? II#13 (fb)) - Soon after the successful removal of the Fantastic Four's powers, the Juggernaut went on the offensive, removing the powers of the incredible Hulk and Daredevil. Xavier bankrupted Tony Stark, causing him to hit the bottle prematurely and leaving him a hopeless alcholic. He then permenantly shrunk Giant-Man and the Wasp into a subatomic universe and re-froze Captain America in a block of ice. Leaving Thor and Namor to their own Asgardian and Atlantean worlds, Xavier made short work of Doctor Doom, able to predict Doom's every move before he could even make any. Charles Xavier also met with Spider-Man and warned him that if he did not stay out of mutant affairs, his aunt May would be told of his secret life. In an attempt to stop the Juggernaut, Russia ordered a nuclear strike against the Juggernaut and World War III began, only to come to a halt less than an hour after it began. With the Earth devastated due to its own fear of mutants, Xavier once again linked up his mind with other brilliant scientists and devised a way to leech to radiation from Earth's biosphere. Upon the cleansing of the biosphere, the Juggernaut warned the humans to leave mutants free and unharmed, and no one need fear him. (Quasar#30 (fb)) - The Juggernaut was observed by Uatu the Watcher and the Time-Keepers as the Time-Keepers threatened to remove his viewing portal unless he retrieved the counterparts of the Living Laser created when the criminal had entered the portal. (What If? II#13) - Years later, as a group of graffiti criminals spray-painted "mutants die bloody" on a wall, the group of mutants known as the X-Men followed them in a hovercraft. The criminals were stopped by an energy blast fired by Cyclops and the mutant known as Thunderbird leapt from the craft, grabbing one of the criminals. Thunderbird's fight was halted by a telepathic message from the X-Men's leader, Charles Xavier, who explained that a group of humans were conspiring against mutants in Midtown. After a long evening of rounding up criminal humans, Cyclops returned home to his daughter, Rachel, and two sons, Christopher and Philip. After asking her dad to tell her a story, Rachel telekinetically flew over to play with her energy-producing brothers. Soon after, Cyclops' wife, Jean, arrived home and attempted to console a depressed Cyclops. 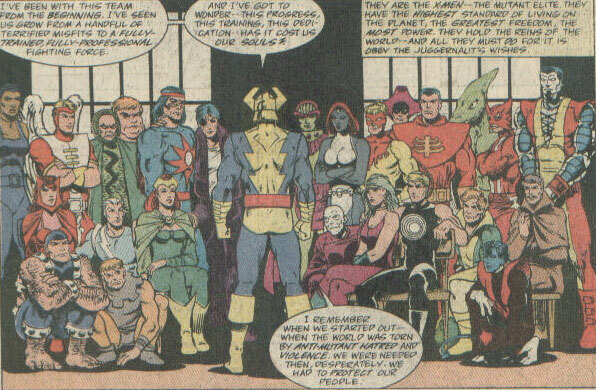 Cyclops then questioned how the X-Men's motives were teaching their children. Later, a group of mutants called the Buzz-Boys attacked the home of an elderly human couple. When the couple left their home and threatened the Buzz-Boys with a shotgun, a squad of X-Men arrived on the scene and stopped the humans from attacking the Buzz-Boys. After watching the humans helplessly attacked just for trying to defend themselves, Cyclops made up his mind and decided to leave the X-Men in order to help defend the humans. As Marvel Girl, Quicksilver, Scarlet Witch, and Colossus joined him, the Angel angrily accused Cyclops of losing his nerve. 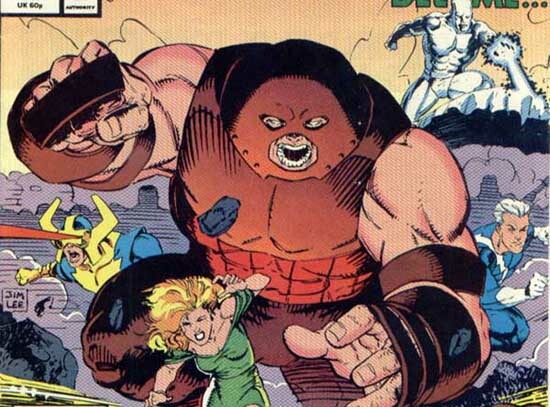 Juggernaut halted the fight and announced that the mutants may leave the X-Men, but if they did so, they could never return. As the former X-Men left their comrades, a human called them into an alleyway, where he revealed himself as Cain Marko, Charles Xavier's stepbrother. Cain led the former X-Men into a spacecraft that shuttled them to the asteroid base of Magneto, who asked Cain to explain to the mutants what had been going on in the years it had been since Magneto was last seen. Magneto revealed that he had bugged the Xavier Estate and had overhead Cyclops's speech to his former comrades. Magneto then announced that the only way to free Earth of Xavier's tyranny was to destroy him. Despite the fact that they didn't like how they had to stop Charles Xavier, the former X-Men agreed to help Magneto and donned the telepathy-proof headbands that Cain Marko had once used. Using the headbands, the former X-Men attacked the Xavier Estate, with Cyclops making his way to Cerebro, where he destroyed its power unit with an optic blast. 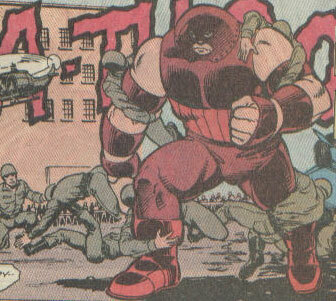 Angered, the Juggernaut ran at the former X-Men, announcing that he did not care if they were mutants and that they would die for disobeying the Juggernaut. As the former X-Men escaped into an alley, Xavier caught up with Colossus and removed his headband. Discovering that the former X-Men were in league with Magneto and his stepbrother, Cain, Xavier used the Magno-Craft that the former X-Men had used to travel to Asteroid M. Arriving through a wall, Juggernaut was confronted by Cyclops, who explained that Xavier was mad and that his dream for a peaceful co-existence between humans and mutants was now a nightmare. Before the Juggernaut could physically retaliate against Cyclops's accusations, Quicksilver hit a button that caused an explosion behind Xavier, launching Charles into outer space. Once Xavier was lost in space, Cyclops informed Magneto that despite the fact that they worked together, that did not mean that he would allow Magneto to become the new tyrant of Earth in Xavier's place. Magneto agreed to let the former X-Men leave his asteroid base, but warned that no one would stand in his way. The former X-Men then looked out of the window on the shuttlecraft and wondered what the future would bring without the Juggernaut controlling the Earth. Comments: Created by Kurt Busiek, Vince Mielcarek, Ian Akin, and Brian Garvey. This reality diverged from the events seen in a flashback in X-Men I#12 (July, 1965). The Buzz-Boys were a mutant gang that terrorized local humans. Their roster was: (from left to right): "Beast Boy," Topper, Cornea, "Red Devil," and Bubbles. "Beast Boy" could scale walls, Topper could charge objects with energy, Cornea could project energy from his eyes, "Red Devil" did not show any powers aside from his devilish appearance, and Bubbles could generate multi-colored bubbles that he could float atop of. 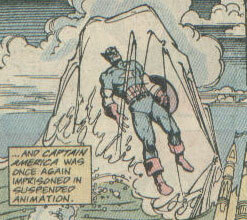 Captain America was exactly the same as his Earth-616 counterpart up until Charles Xavier re-froze him in a block of ice, one again placing him in suspended animation. 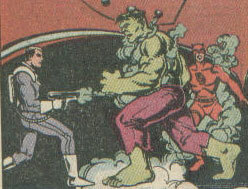 Daredevil and the Hulk were exactly the same as their Earth-616 counterparts until one of the Juggernaut's men sprayed them with an experimental gas that caused them to lose their powers. Human Torch, Invisible Girl, Mister Fantastic, and the Thing were exactly like their Earth-616 counterparts. 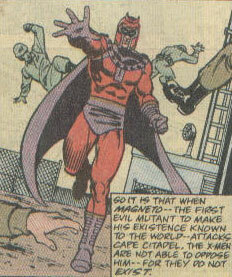 They were called in to stop Magneto when he attacked the Cape Citadel military base, where they easily drove him away. When Charles Xavier destroyed the Sentinel factory, the Fantastic Four took it upon themselves to stop the Juggernaut's rampage. Attacking the X-Men at the Xavier Estate, the Fantastic Four were rendered powerless by a spray created by the Juggernaut himself. Xavier informed them that the power loss was permenant and ordered them to leave his Estate. Giant-Man and the Wasp were the same as their Earth-616 counterparts until Charles Xavier had them permenantly shrunk into a subatomic universe. Bobby Drake was, like his Earth-616 counterpart, a mutant who could freeze moisture in the air. Since Charles Xavier was trapped beneath a mountain in Korea, Bobby instead joined Magneto's Brotherhood of Evil Mutants. During their attack on the U. N., Iceman was killed by a soldier wielding a flamethrower. 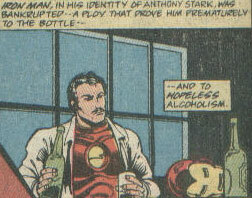 Anthony Stark was exactly like his Earth-616 counterpart up until he became bankrupt and prematurely alcholic. He eventually became a hopeless alcholic, unable to pull himself from the bottle's temptations. When Charles Xavier and Cain Marko were serving military duty in Korea, Cain stumbled upon the ancient temple of Cyttorak. Attempting to grab the ruby inside the temple, Xavier pushed Cain out of the way and accidentally came into contact with the ruby himself. Transformed into a human juggernaut, Xavier was buried in the resulting cave in. Years later, he managed to dig himself from the caved in mountain and make his way to the United States, where he found Magneto trying to take over the U. N. Defeating Magneto, Xavier convinced his Brotherhood to become the X-Men. He then fashioned the X-Men into a police force that protected all mutants, but left humans defenseless. Eventually growing tired of ruling over the humans, some of the X-Men left Xavier and met with Magneto. Magneto convinced them to help him defeat Xavier and the former X-Men led Xavier to Magneto's asteroid base, where they launched him into space. With the Juggernaut defeated, the former X-Men wondered what the future would bring. Magneto was the first mutant to go public, attacking the Cape Citadel military base. After he was driven off by the Fantastic Four, he founded the Brotherhood of Evil Mutants with Mastermind, Quicksilver, Scarlet Witch, and Toad. He then took over the small country of Santo Marco and from there, recruited for the Brotherhood until it was a legion under his control. Months later, he led the Brotherhood to attack to the U. N. building, but was stopped by the arrival of Charles Xavier, who convinced the Brotherhood members to join him as his X-Men. Angry at Xavier, Magneto attempted to crush him but his magnetic powers would not work on Xavier's magical armor. Soon after, Magneto managed to find Cain Marko and the two plotted against Xavier. Years later, Magneto sent Cain to retrieve Cyclops, Marvel Girl, Quicksilver, Scarlet Witch, and Colossus when they quit the X-Men. Magneto then sent the former X-Men to gain the attention of Xavier, now calling himself the Juggernaut. The X-Men retreated back to Magneto's asteroid base, where Juggernaut followed them. Once Xavier was onboard, Quicksilver hit a button that caused an explosion behind Xavier. The Juggernaut was launched into space, where he would forever float. After the battle, Cyclops warned Magneto that he would not allow Magneto to usurp control over the Earth as the Juggernaut had, to which Magneto replied that he would let the former X-Men leave, but that no one would stop him. Cain Marko was the bullying stepbrother of Charles Xavier. While the two were serving military duty in Korea, Cain found the ancient temple of Cyttorak. Attempting to grab the ruby inside, Xavier stopped Marko and instead got transformed by the ruby himself. Leaving Xavier to die, Marko fled back to the United States, where he inherited the Xavier Estate. When Xavier returned from Korea, he kicked Marko out of the mansion, with Marko vowing revenge. Soon after, Marko met with Magneto and the two conspired for years against Xavier. When several of the X-Men quit the team, Marko saw his chance. He met with the former X-Men and helped convince them to aid Magneto against Xavier. The former X-Men led Xavier to Magneto's asteroid base, where they launched him into space. Following the defeat of the Juggernaut, Cain became the lackey of Magneto. The children of Marvel Girl and Cyclops, each of them were born mutants and lived in a nice apartment with their parents. 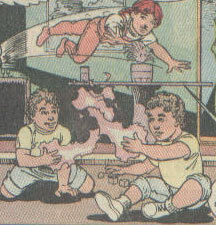 The children are: (clockwise from top): Rachel, who had telekinesis; Christopher, who could project energy; and Philip, who could also project energy. The X-Men were Charles Xavier's mutant police force that aided all mutants and persecuted all humans. Many of the original X-Men members were comprised of former Brotherhood of Evil Mutants and other mutants soon joined the X-Men as well. The roster was: (from left to right): Frenzy, the Angel, Scarlet Witch, the Beast, Toad, Quicksilver, Vanisher, Blob, Thunderbird, Marvel Girl, Callisto, Cyclops, Mesmero, Mystique, Caliban, Polaris, Pyro, Changeling, Unus, Havok, Banshee, Sauron, Sunfire, Nightcrawler, Mastermind, and Colossus. Eventually growing tired of ruling over the humans, Quicksilver, Scarlet Witch, Marvel Girl, Cyclops, and Colossus left the team and met up with Magneto. Together with Magneto, the former X-Men managed to lure Juggernaut to Magneto's asteroid base, where they launched him into space. Without the Juggernaut to guide them, the X-Men's future seemed uncertain.